It was an interesting take on a familiar problem: how to bridge the gap between the PC (Internet video) and the TV. 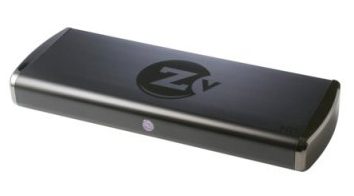 ZeeVee’s original consumer-focused solution, the Zv100 set-top box, utilized a home’s regular cable wiring to send video content from a PC to any number of TVs by effectively creating its own closed circuit HD television channel. However, the product never took off, selling “just a few thousand units” and has since been canned. The reason, ZeeVee’s CEO Vic Odryna tells NewTeeVee, is that the product was too expensive and too complicated. When the “ZvBox” was first announced, I noted that its $499 price tag was much higher than competitors, all of which use WiFi or Ethernet to shuttle content around the home, rather than coaxial in ZeeVee’s case. ZeeVee discovered that while its technology wasn’t wanted in the home, there were other industries that were interested and willing to pay for the ability to distribute HD content to their own local systems. With the Zv100 box on hold, ZeeVee focused on creating the ZvPro 250, which launched two weeks ago. The $2,500 price tag is too steep for most consumers, but it’s cheap for places like hotels looking to create and distribute HD content to a network of televisions. At the same time, ZeeVee isn’t turning its back on consumers entirely. Today the company updated its Internet TV browser (Windows only, with a Mac version due out soon). The new update to the Zinc browser (formerly known as the ZViewer) is very Boxee-like, by ZeeVee’s own admission, and pulls in content from Hulu, CNN, CBS, ABC, YouTube, Netflix and others, ready for display on a TV.